This pool was paid for by two public loans. The City of Susanville is the only incorporated city in Lassen County. 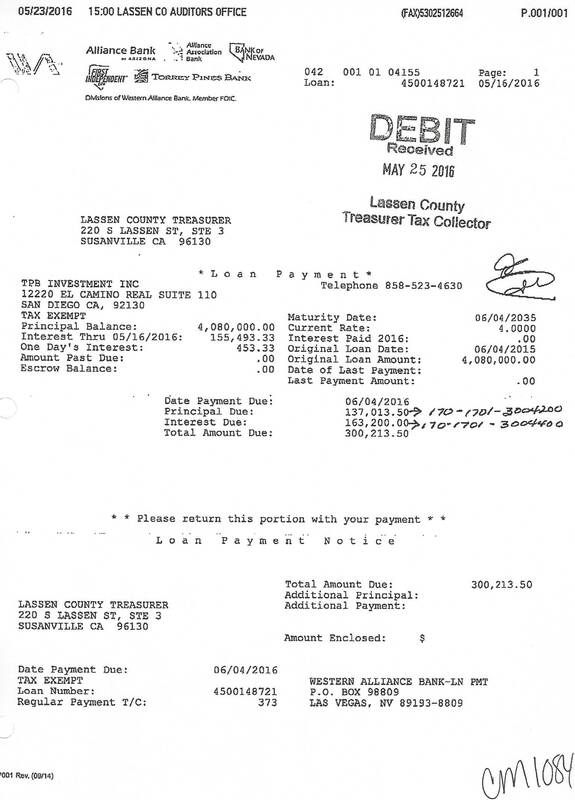 The taxpayers of Susanville donated a million dollars + and the taxpayers of Susanville (residents of Lassen County) paid another million dollars + from the County coffers. 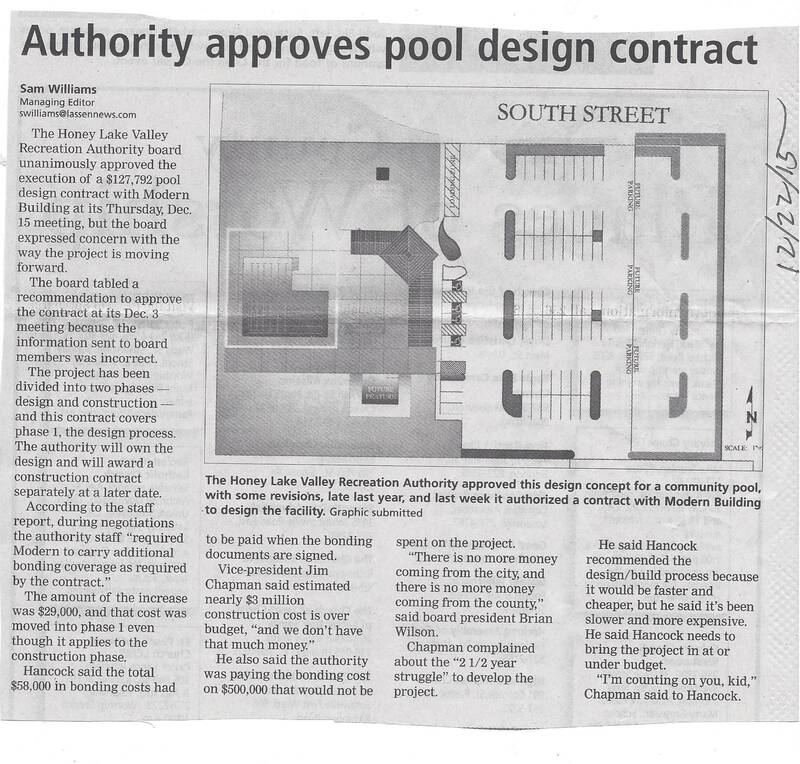 Susanville taxpayers paid twice so naturally they should act like they own the Honey Lake Valley Pool at 800 South Street. The County has relinquished the management, financial control and interest over the pool. The City of Susanville now totally runs the pool in all aspects. 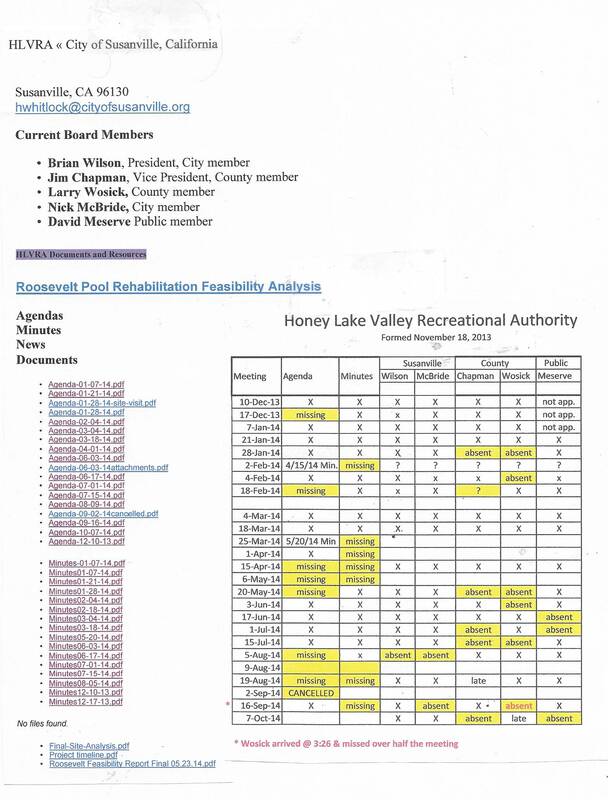 This explains why the County will not attach any link to the Honey Lake Valley Community Pool on the County's website, ANYWHERE. 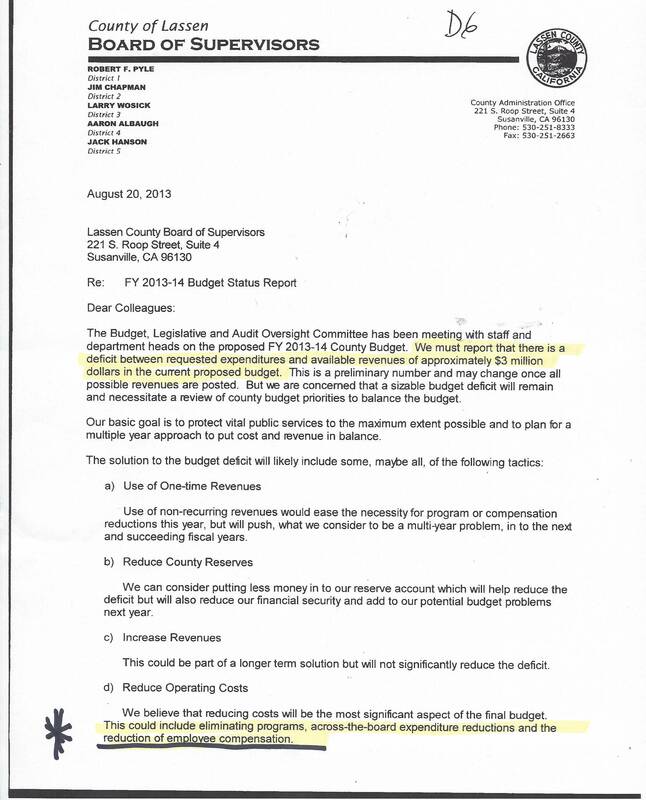 The City of Susanville has refused to link even the Lassen Rural Bus Schedule on their website. 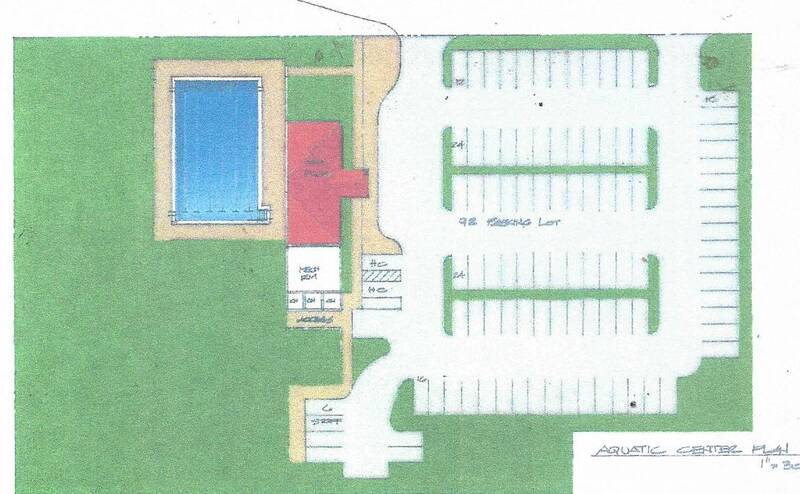 The "Susanville" Community Pool ......could it be true? 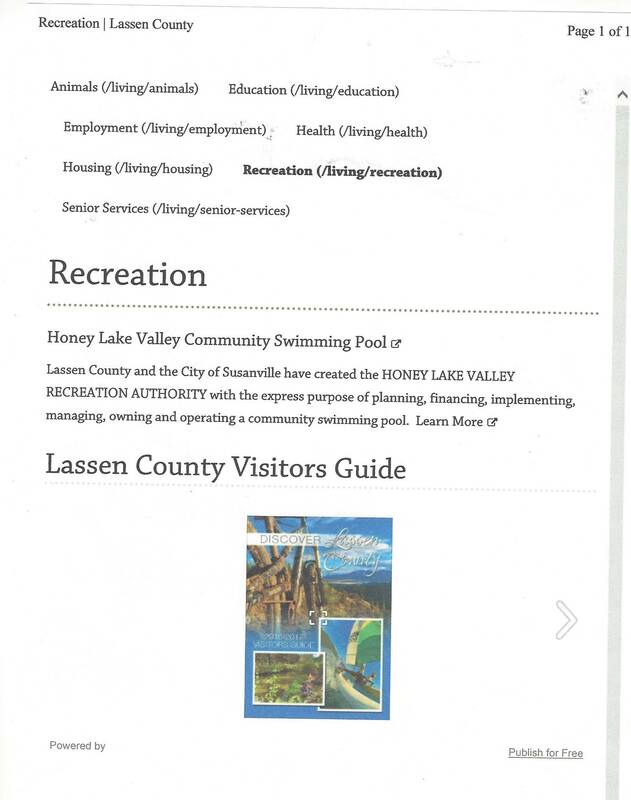 THERE IS NO LINK TO THE LASSEN RURAL BUS SCHEDULE THAT WOULD BRING SWIMMERS FROM ALL OVER LASSEN COUNTY TO THE NEW POOL ON LASSEN COUNTY'S WEBSITE, OR THE CITY OF SUSANVILLE OR THE HLVRA'S WEBSITE? 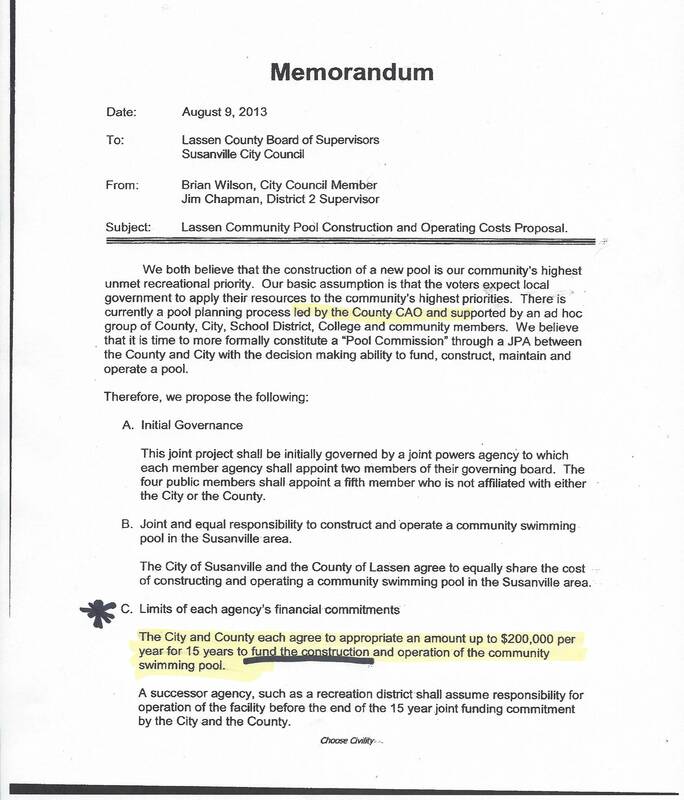 This pool is a County wide swimming pool that Lassen County and the City of Susanville paid for with tax dollars. The HVLRA has installed a bus kiosk in the front so that LRB can drop off/pick up swimmers. 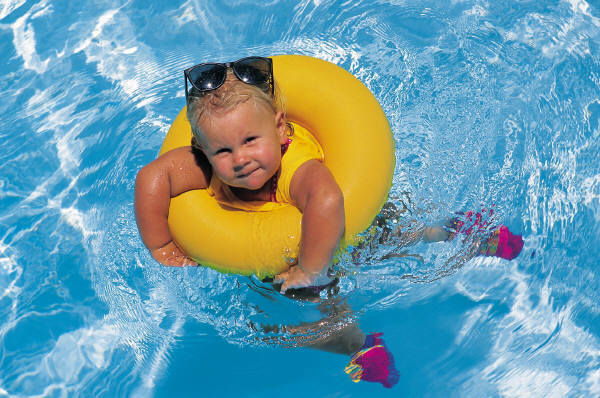 The HVLRA now has a website for pool hours but needs to add a link to the Lassen Rural Bus website. Don't worry, they will grow ! 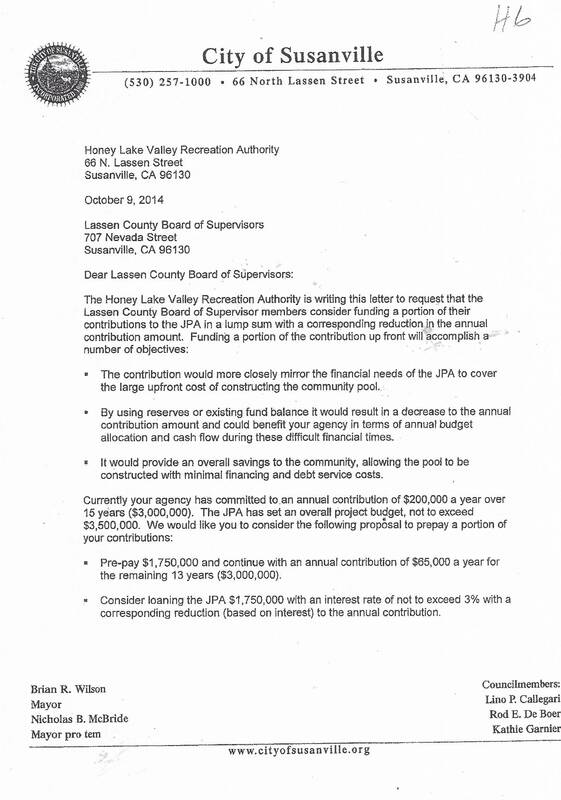 HLVRA Leases "triangle" from the City of Susanville ? 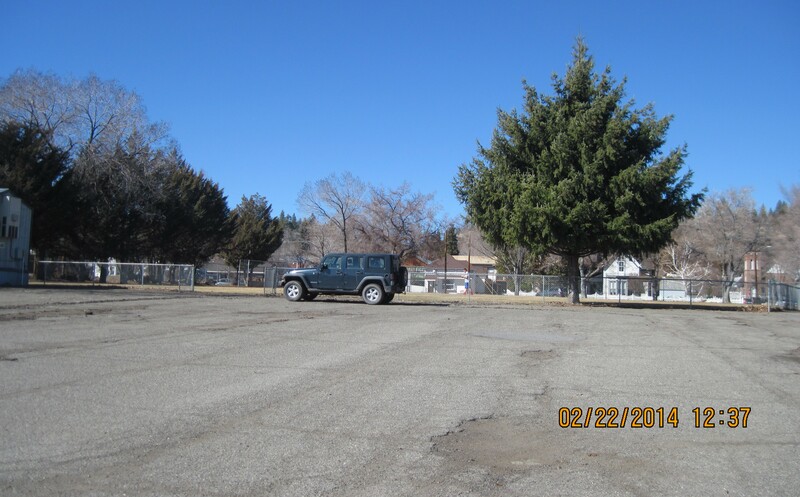 The HLVRA leased the .17 acre triangle from the City of Susanville for 99 years. 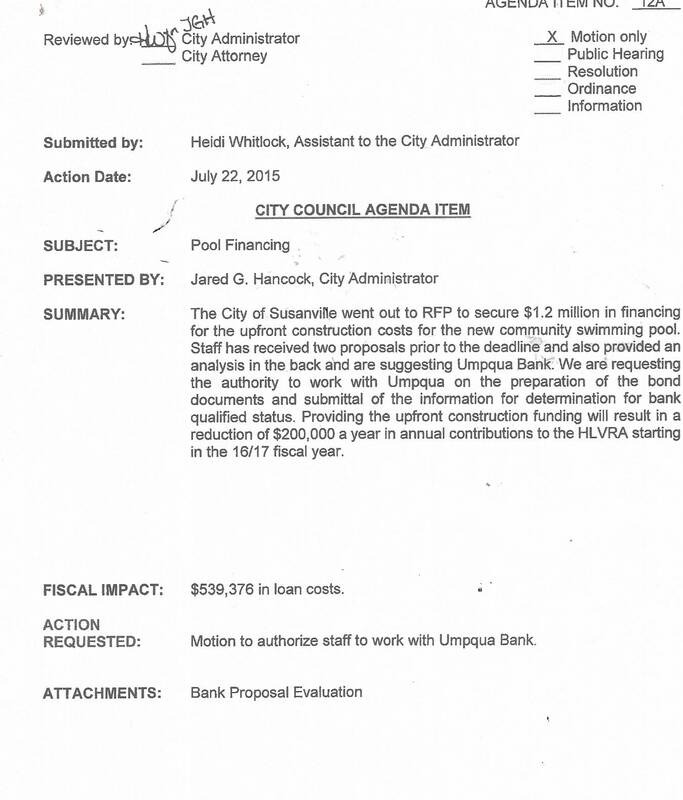 The community pool project shrank when the funds could only provide for the construction of a smaller pool and a small administration building. 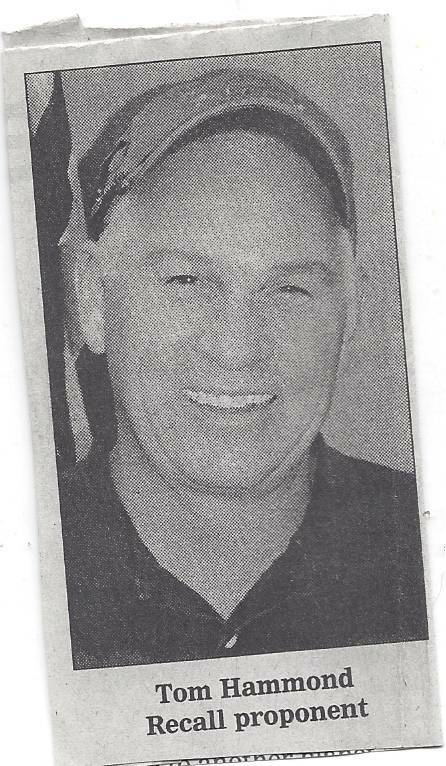 "Public help is not needed"
According to Lassen County CAO Richard Egan, the HLVRA has asked for the Supervisors to pay the annual payment early in August. 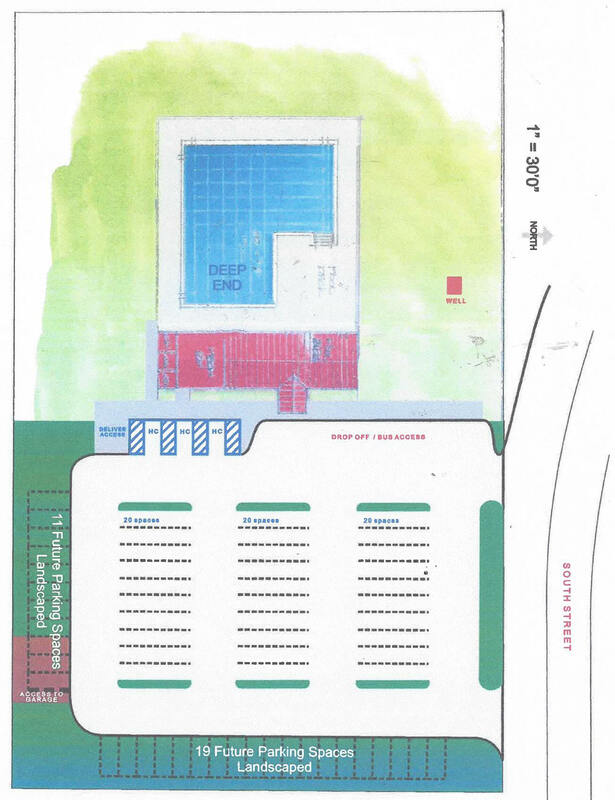 The original conditions have changed since the Lassen County Supervisors voted to take out a $4,080,000 loan to build the new pool and purchase a building. When Kan We Help asked, the Supervisors refused to disclose what the annual payment. This payment is due on June 4 of each year until 2035. This payment takes all of the Tobacco Settlement Fund each year. The Supervisors told the public the County's annual HLVRA support payment would be paid from the Tobacco Settlement Fund. There is less that $1,300 left in the Tobacco Settlement Fund until it is replenished with an "undetermined" amount each year. "HE" was responsible for getting the pool. Community Pool or Puddle Pool? "Chapman walks out of pool meeting ?" Williams writes that there are "nattering naysayers" against the pool project. The bad decisions, of a clueless HLVRA Board, is beyond frustrating. 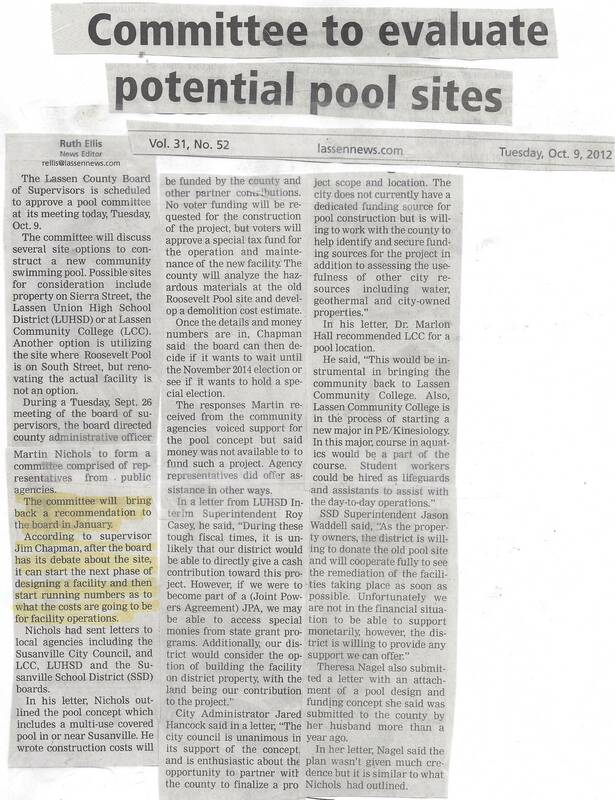 The HLVRA is no more closer to starting construction than they were in 2013. While the Executive Director Jarod Hancock continued to claim the "DESIGN BUILD" process would save money and the professionals told him that was the wrong approach.......now Mr. Hancock was reluctant to admit that the professionals were right. 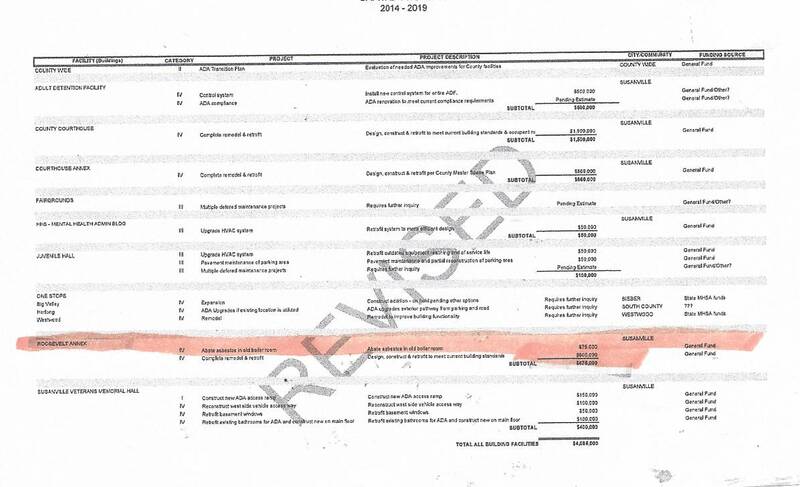 Hancock: "It's been slower and more expensive"
The contract "for design only" Mr. Hancock presented to the HVLRA Board, on December 3, 2015 was for $73,000. 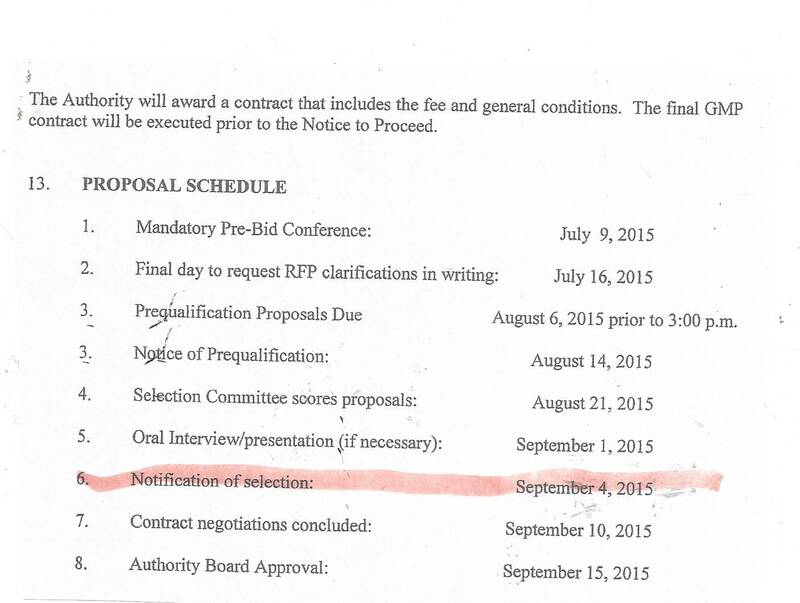 The Contract the Board approved was for $127,792. 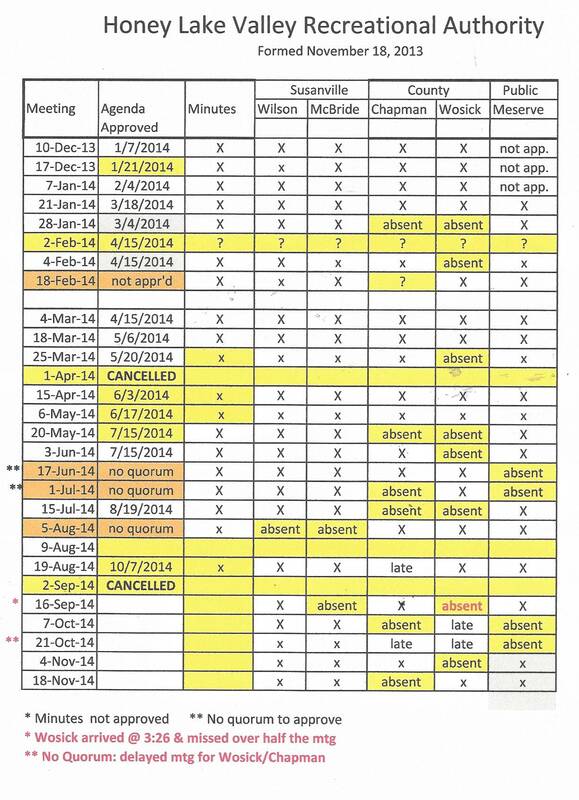 For the second meeting in a row no board packets had been made for the Directors or the Public. Brian Wilson, Jim Chapman and Nick McBride did not attend this meeting. Vice-Chairman Jim Chapman was at a "vacation/meeting" in Monterey, Ca. It was not stated why Wilson or McBride did not attend. Dave Meserve chaired the meeting. Lassen County Auditor Diana Wemple told the Directors that the JPA would begin reimbursing County officials in April of 2016. The HLVRA Board of Directors would not listen to those professionals that strongly suggested getting a set of Plans done a year ago. 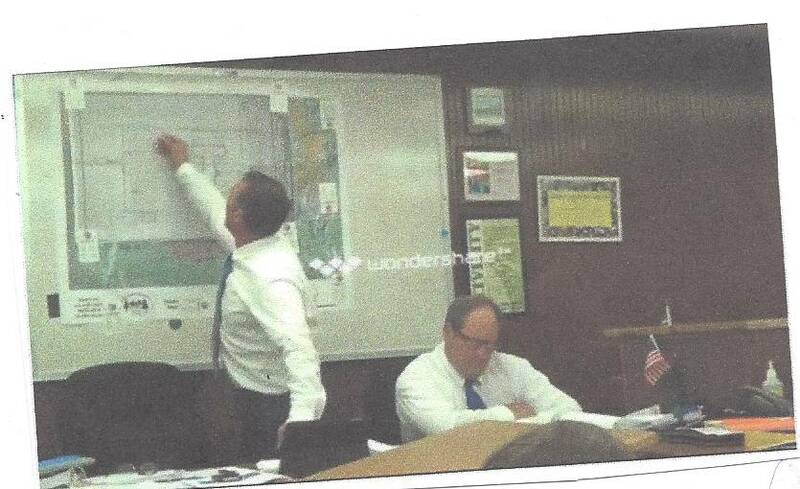 The original thought was to have "plans" made and then issue an RFP for construction. Things went wrong when the decision was made to have one company do everything. 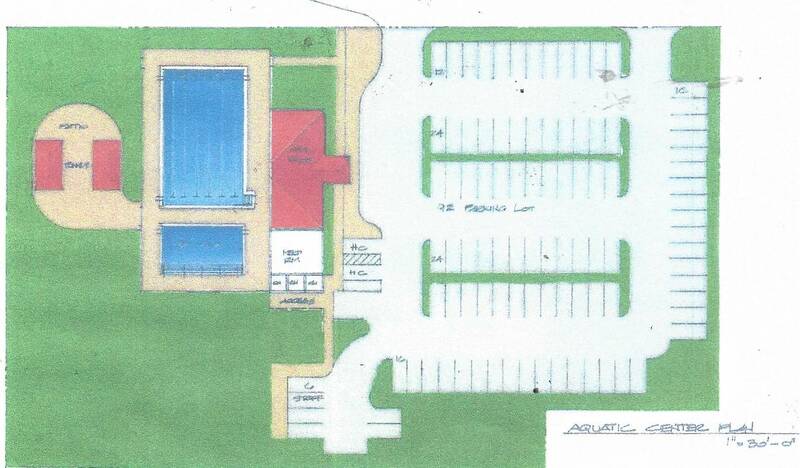 This pool cannot be built for $2.2 million & the HLVRA Board was told this over and over. 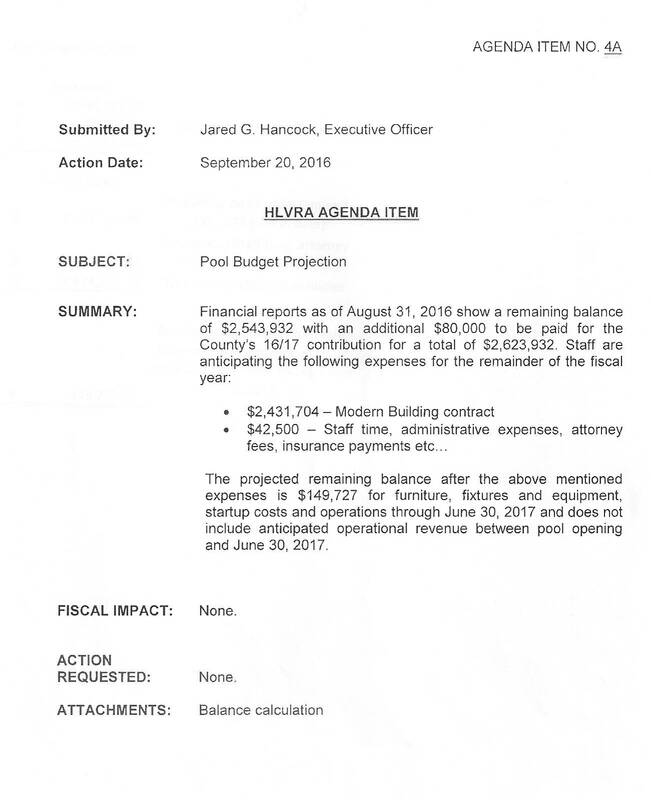 The Board voted to sign a contract with Modern Building and try and scale down the pool because they do not have $3,000,000. 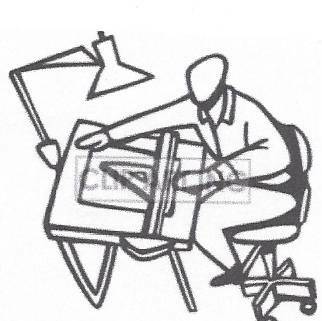 THEY ALSO TALKED ABOUT JUST HAVING THE DESIGN "PLANS" DONE AND THEN BACK OUT OF THE CONTRACT WITH MODERN !!!!!!!! 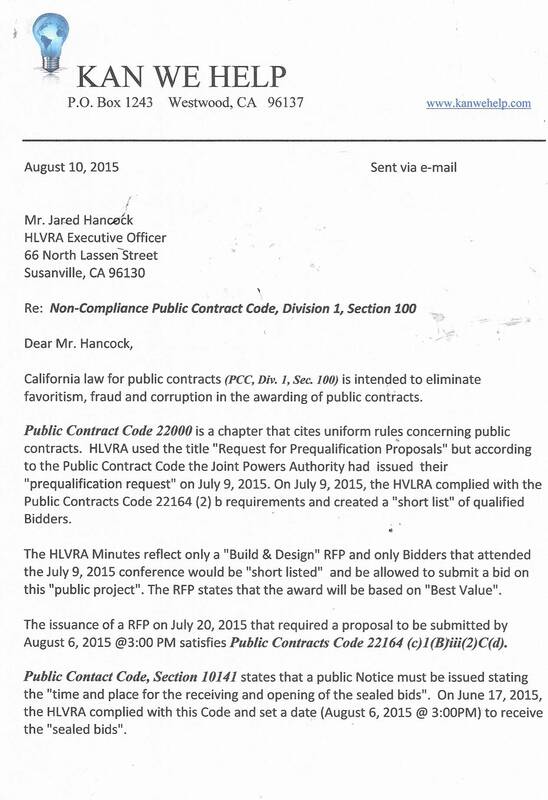 The "Design/Build" PCC Section does not give the HLVRA the right to close the bid opening to the public. This was a policy decision. 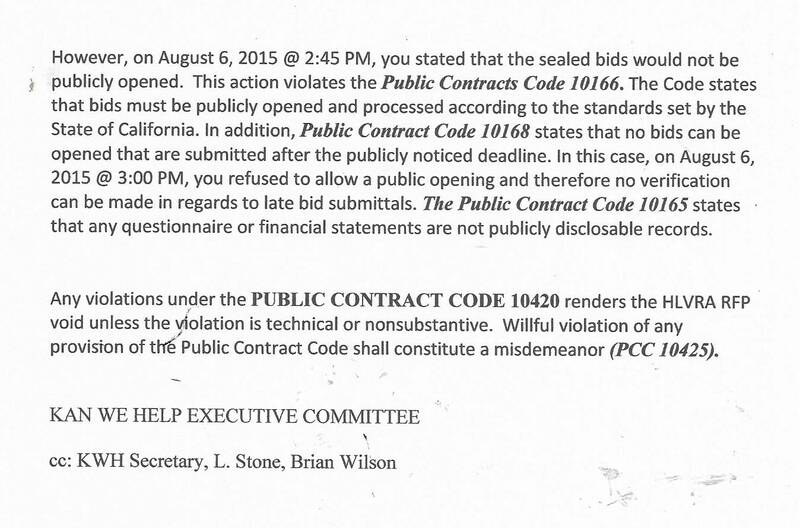 The day (August 6, 2015 @3:00 PM) the public Bids were to be opened, Executive Officer Jared Hancock decided to open the bids secretly. Hancock based his decision, for the secrecy, on Public Contract Code 22160-22169. Of course, this government code does not give him any authority to make the bids secret. 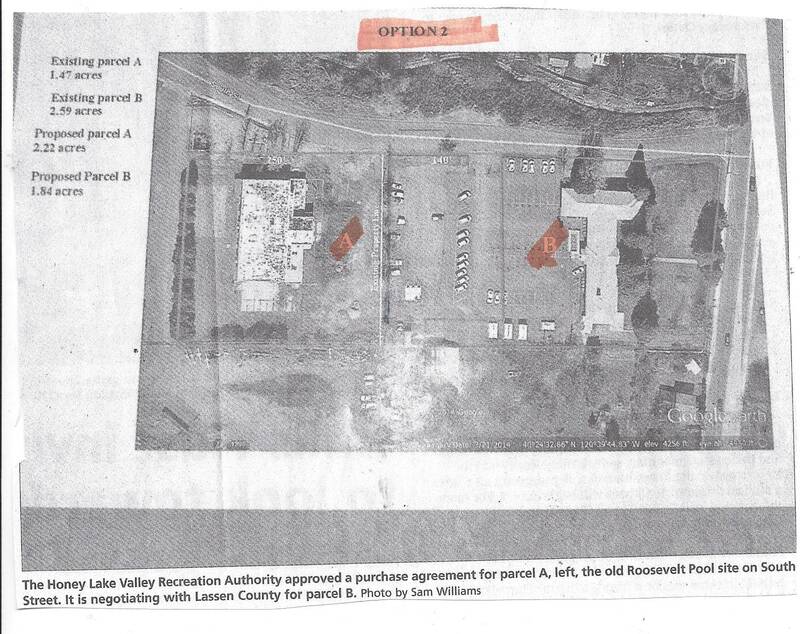 states that the Bids cannot exceed the "Guaranteed Maximum Price"
Collateral: Susanville Fire House 0r Police Station ? 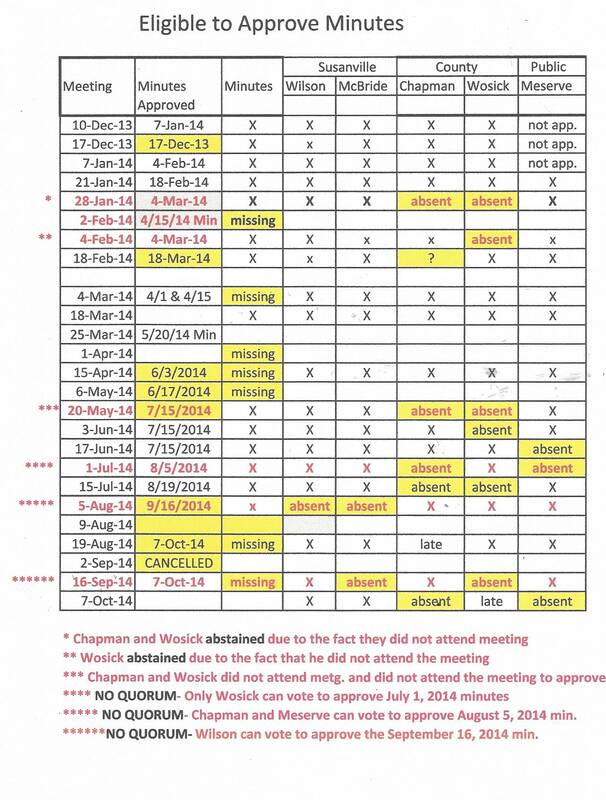 Chapman attends less than 50% of the JPA's meetings and when he does show up he talks and talks and talks. Did we mention that he just T A L K S.
Chapman has been responsible for most of the delays. Lassen County District 2 Supervisor Jim Chapman and District 5 Supervisor Tom Hammond sit on the Honey Lake Valley Recreation Authority created by the City of Susanville and Lassen County. These two men attended the June 16, 2015 HLVRA meeting when the Executive Director Jarod Hancock announced that Susanville did not get the OGALS Grant. 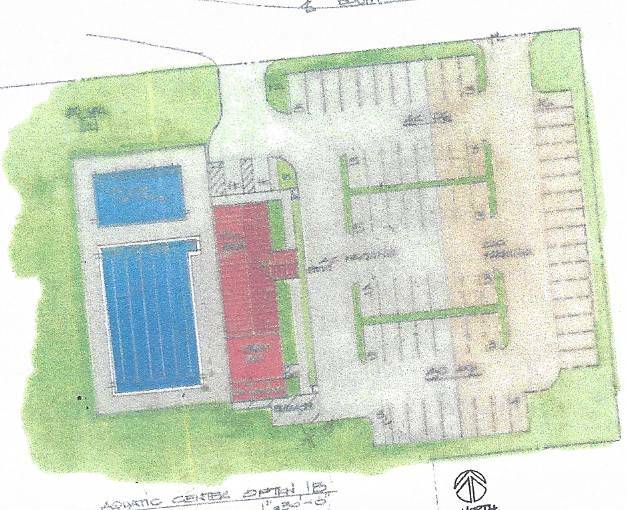 The OGALS Grant, if awarded, was to be used for Susanville's share ($1.1 million) of the construction costs for the community pool. 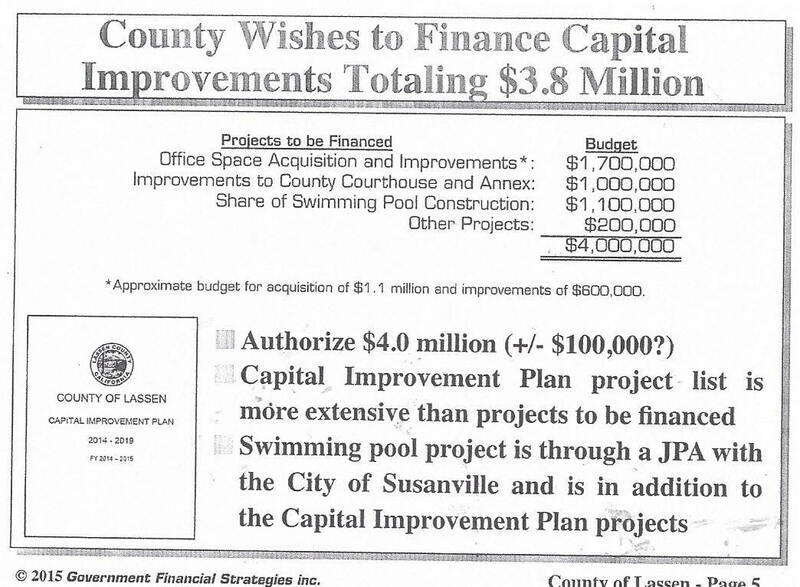 Susanville must now find another source for the pool construction costs. 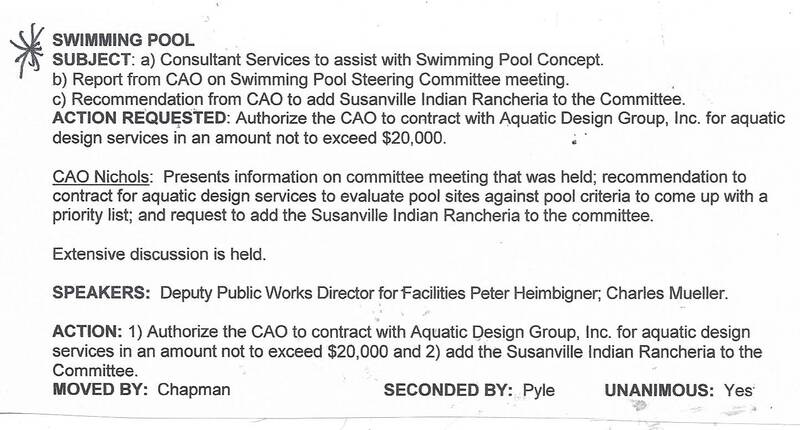 The County will hold onto the $1.1 million that they borrowed on June 4, 2015 until Susanville can find a source for the pool construction costs. 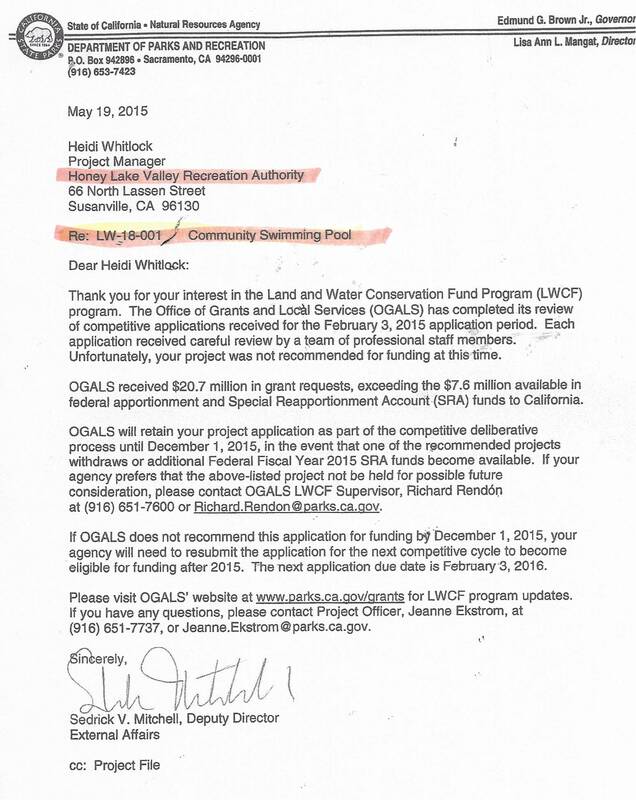 Chapman and Hammond stated clearly that this Grant had nothing to do with the pool. YESTERDAY, AT THE BOARD OF SUPERVISORS MEETING, CHAPMAN AND HAMMOND FAILED TO REPORT THIS "FACT" DURING AGENDA B-4 (Unagendized Reports by Board Members aka meetings they attended) AND WERE CLEARLY ANNOYED THAT THE ISSUE WAS BROUGHT UP BY KAN WE HELP. There are no planned "amenities". This is a basic "L" shape pool. 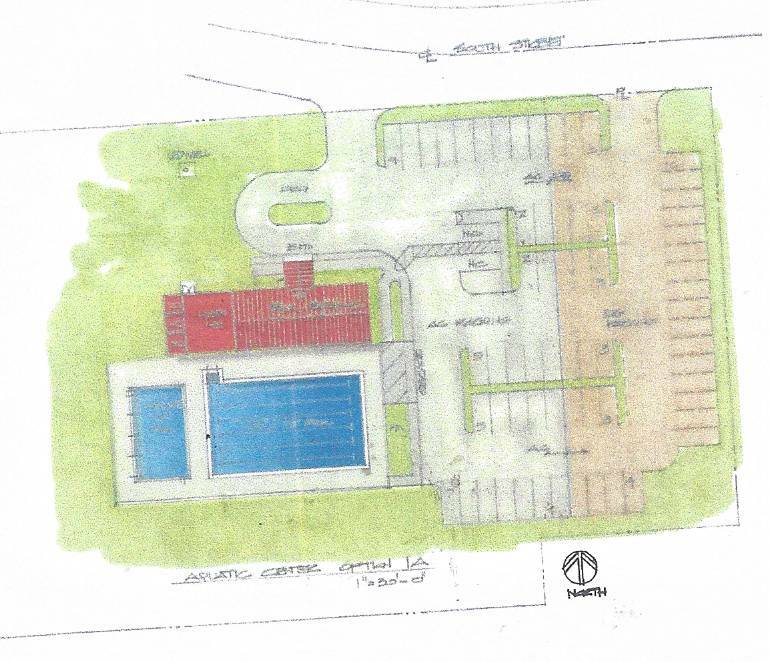 The "Pennies for the Pool" fund will be able to fund "amenities" after the pool is built. 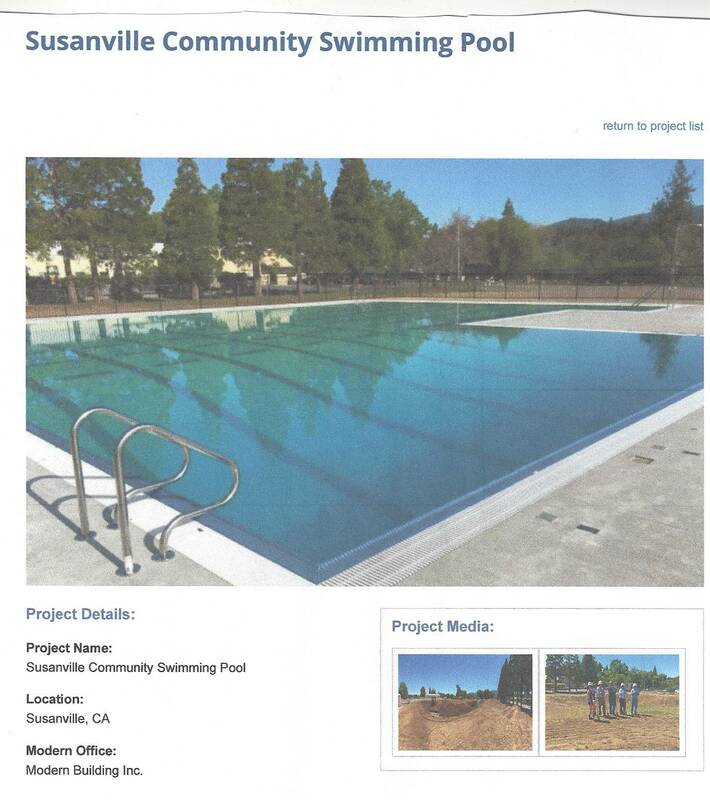 Lassen County Supervisors and the only incorporated city in the County, Susanville, formed a Joint Powers Authority in 2013 to build a community pool. 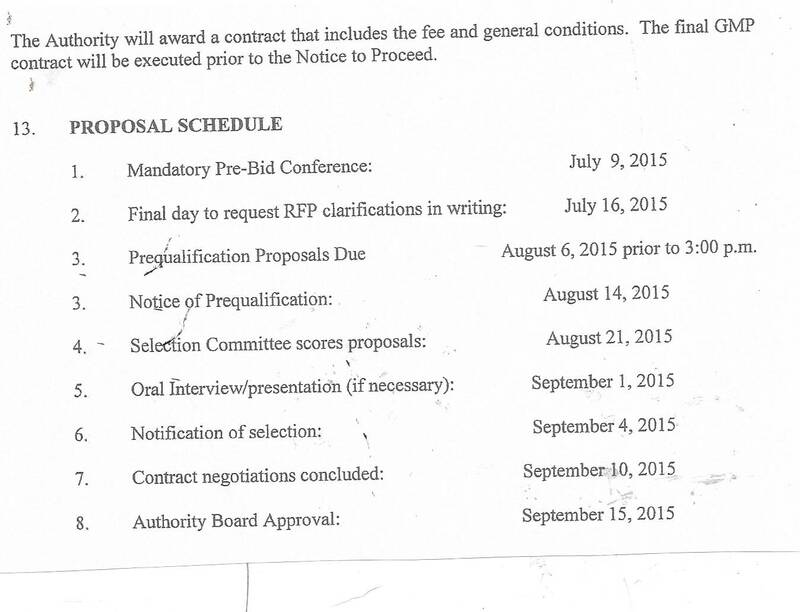 This Board has no sense of urgency and indicated that this process could take years. After a year and half, this Joint Powers Authority is just holding one meeting after another that produces nothing. They don't care if meeting notices are published. They don't seem to care that no one attends the meetings anymore. They don't seem to care if the Minutes are correct of past meetings. There is no interest, no progress, no funding. This Board has ZERO knowledge, experience or interest in building the pool. 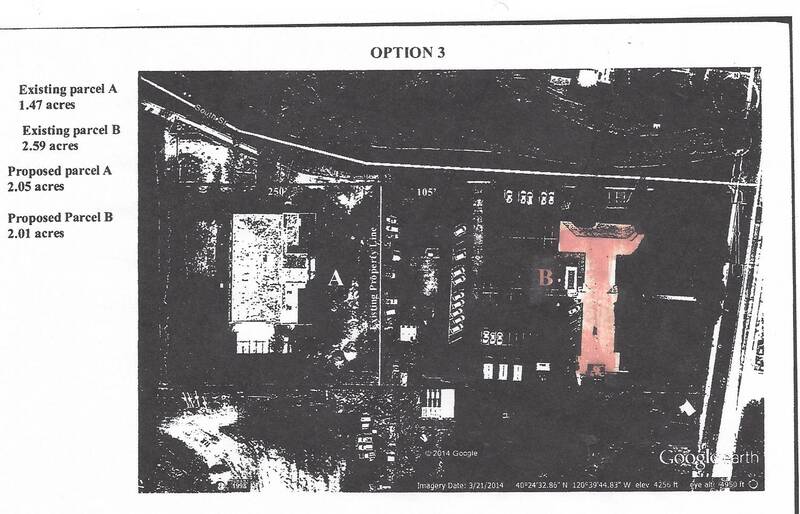 The footprint of this project basically takes up the entire lot and Supervisor Chapman wants more discussion on where to place the pool? The old Roosevelt pool has been demolished but the HVLRA struggles to move forward. 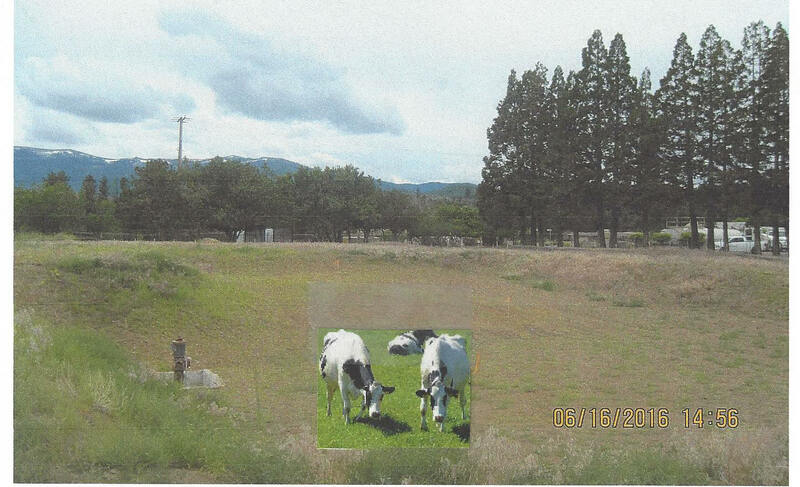 The City of Susanville applied for a Grant but will not know before September 2015 whether or not they will get funding from that source. OF AGENDA'S NOT BEING POSTED? Jim Chapman lashed out at the public for attending too many public meetings and he feels that the agenda is available at enough places. That explains all of the empty chairs at all of the meetings. The problem: the Brown Act requires the Agenda to be posted on their website. 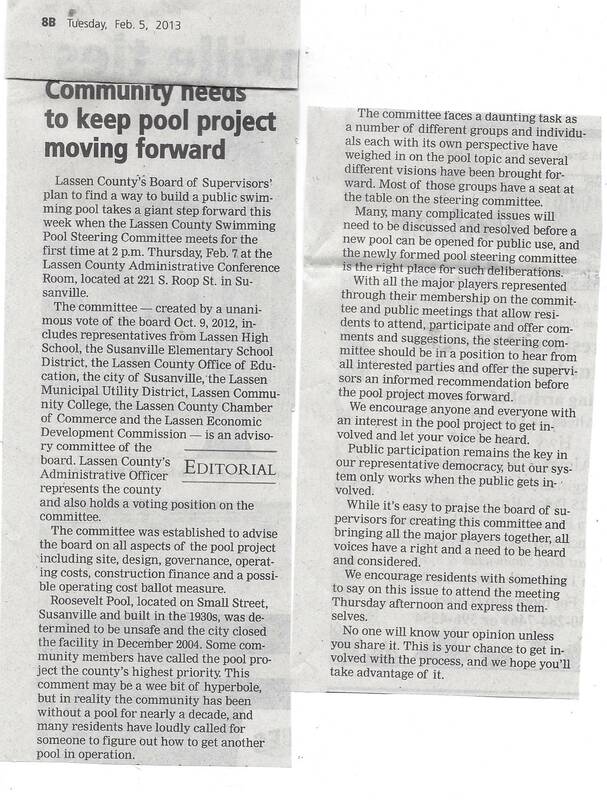 The JPA was established in late 2013 to build a Community Pool for Lassen County. 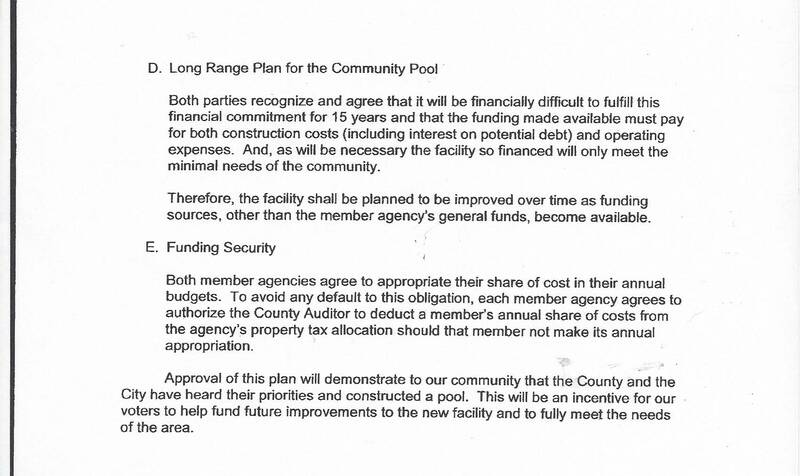 To-date, they have not secured any funds to build the pool. The old Roosevelt Pool has been demolished and now, no money to start construction. If the HLVRA doesn't want you to attend, not posting their agendas is a good way to accomplish this. The big problem: No property has been transferred to the JPA. 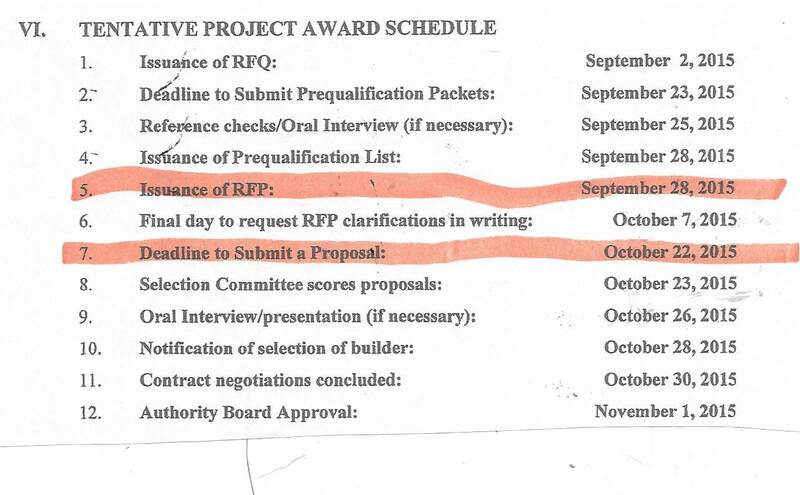 The HLVRA could not release the supporting documents for their "staff hours" because they did not exist. 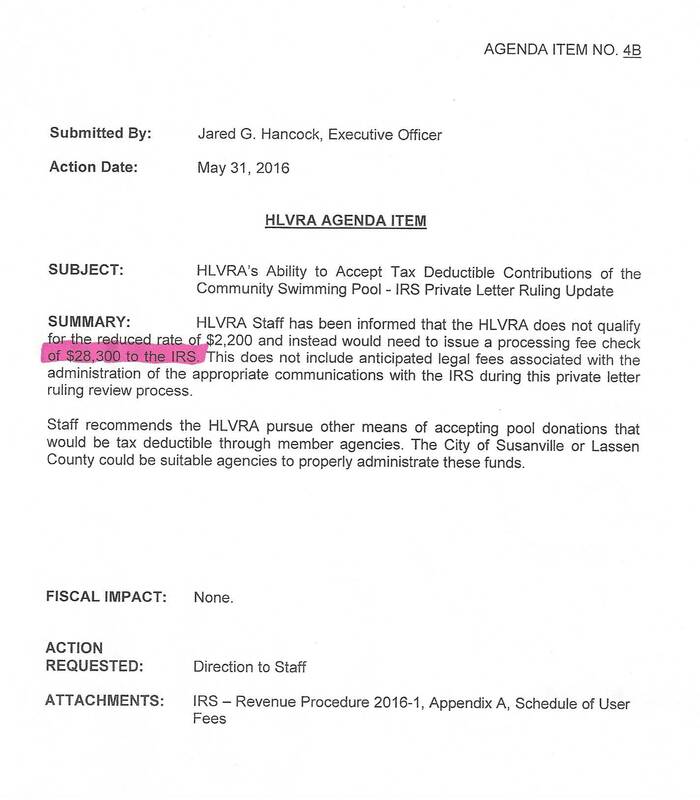 Because the HLVRA was non-responsive, Kan We Help also filed a Public Records Request for the HLVRA invoices supporting documents with the Lassen County Auditor. 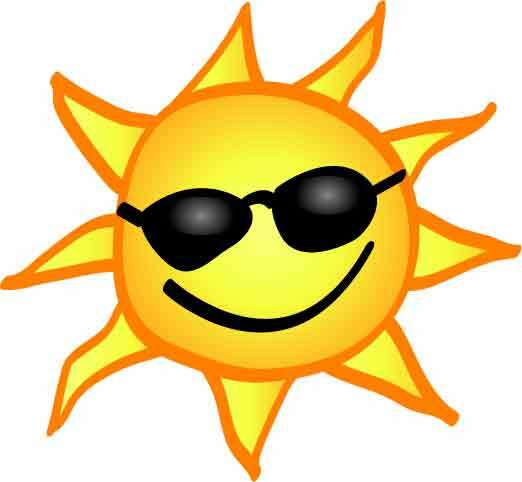 The HLVRA finally provided newly created staff hours reports. These staff hour reports were filled out by one person and coincidently matched all of the invoices billed to the County. 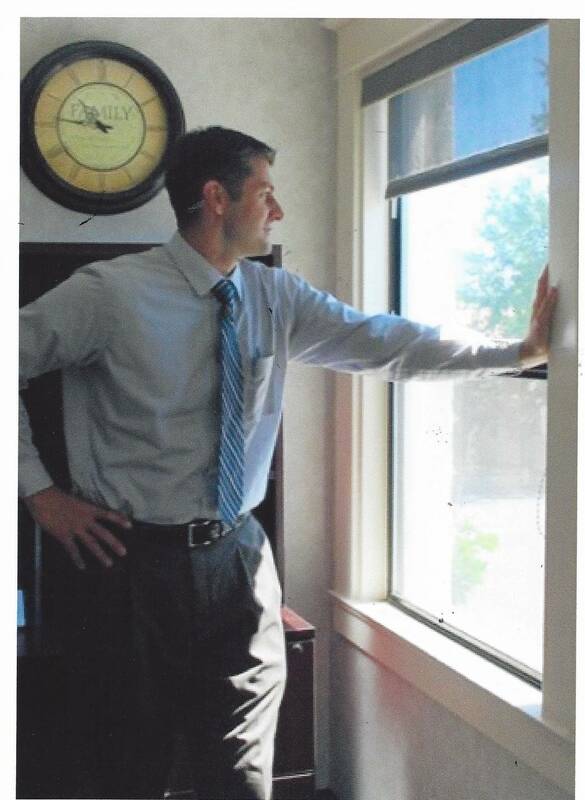 Obviously, this was an effort to validate the $58,000 billed to the HLVRA for Susanville staff time. Hopefully, when these documents are requested in the future, they will be legitimate. 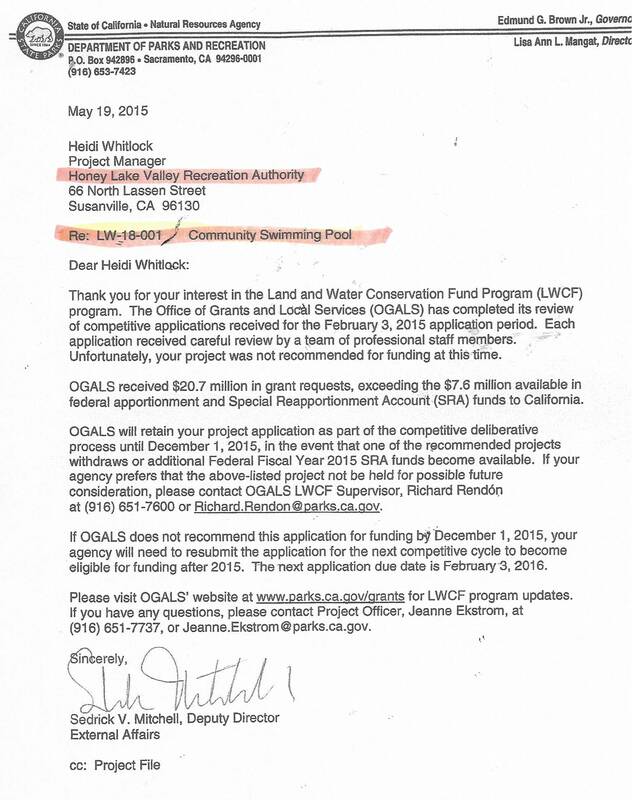 Honey Valley Lake Recreation Authority meets AND DOES NOTHING. Supervisor Chapman absent again. This JPA Board has had the "Funding" conversation over and over and over. 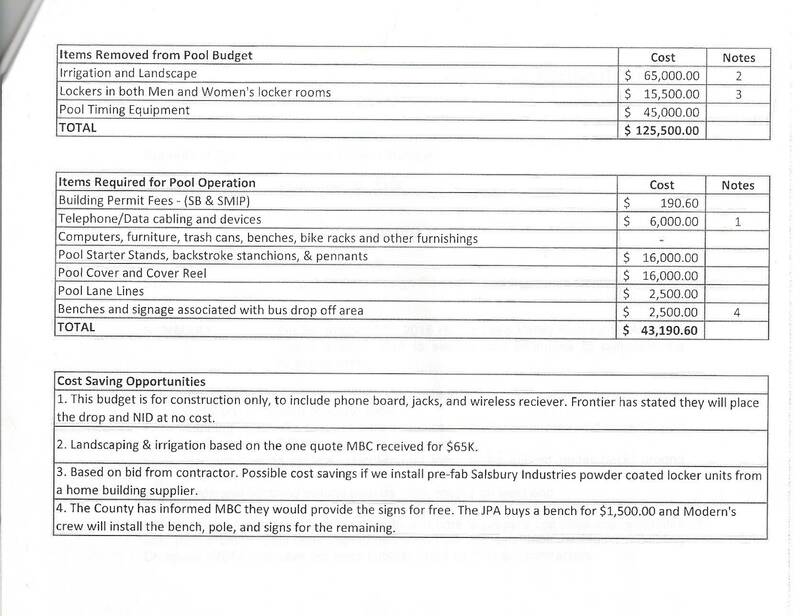 The Supervisors have hidden six pages of County's Capital Improvement Projects from the public. These projects still exist but the Supervisors don't want the public pressure to complete them. 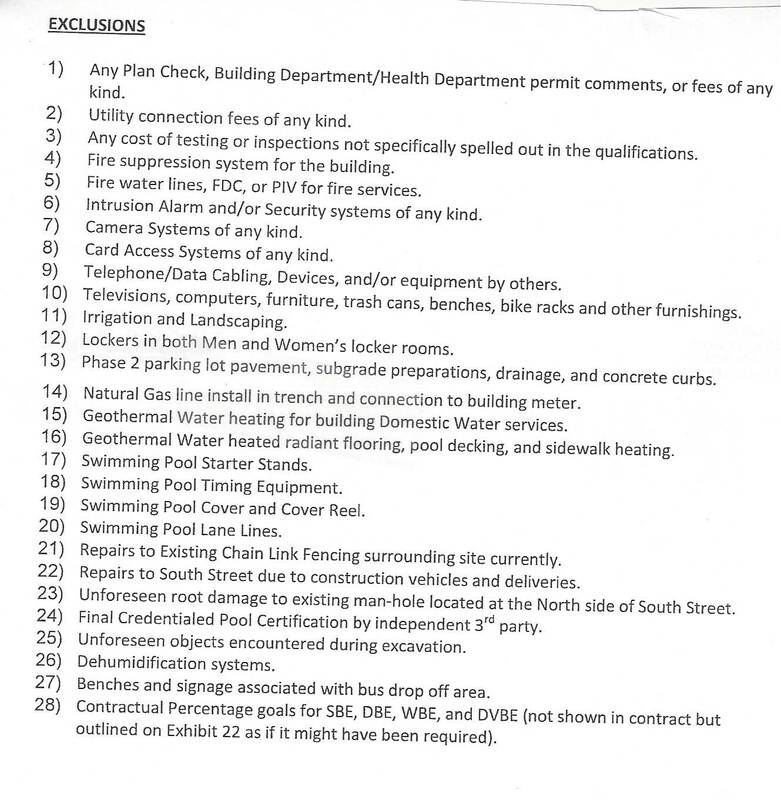 The HVLRA will be one year old on November 18 and the two public entities that make up this Joint Powers Authority (City of Susanville and Lassen County) have yet to secure any money to construct this community pool. 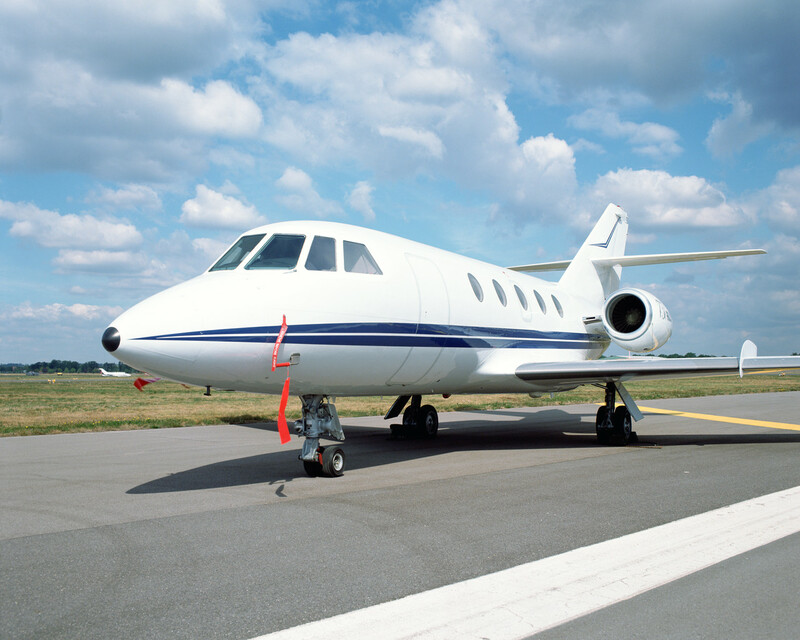 The costs now exceed $3 million. The JPA was asked to begin being accountable for the $800,000 now in its' treasury. Jared Hancock showed resistance to this type of accountability. President Brian Wilson asked Mr. Hancock to present a financial report at their next meeting. 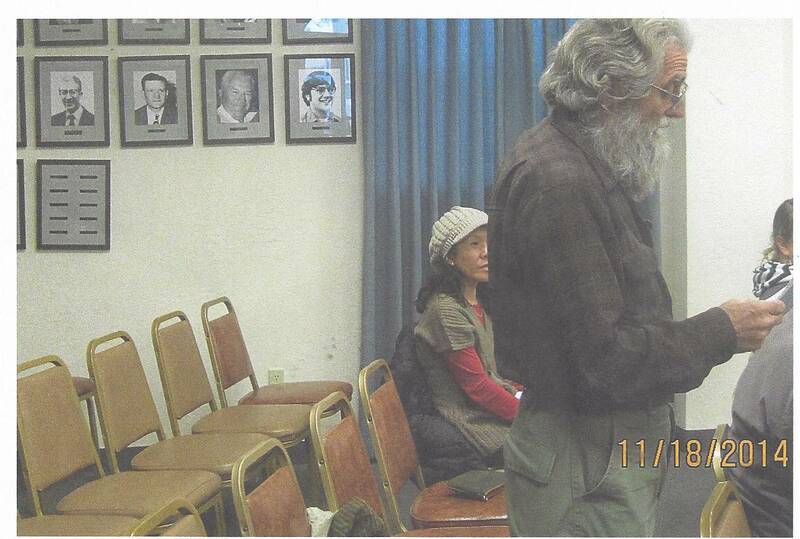 In the mean time, the HVLRA met at 3:11 PM, across the street at the Susanville City Hall, and decided that a short mini-meeting was all they needed. A quick sweep through the short agenda and they went home. 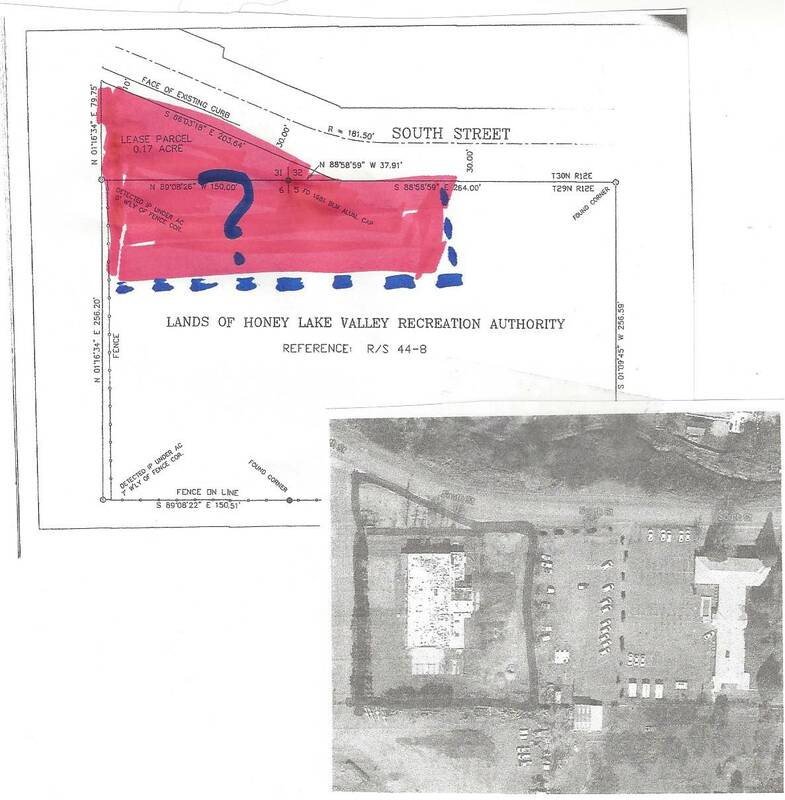 A whole lot of cleaning up needs to be done on the Honey Lake Valley Recreation Authority Board. 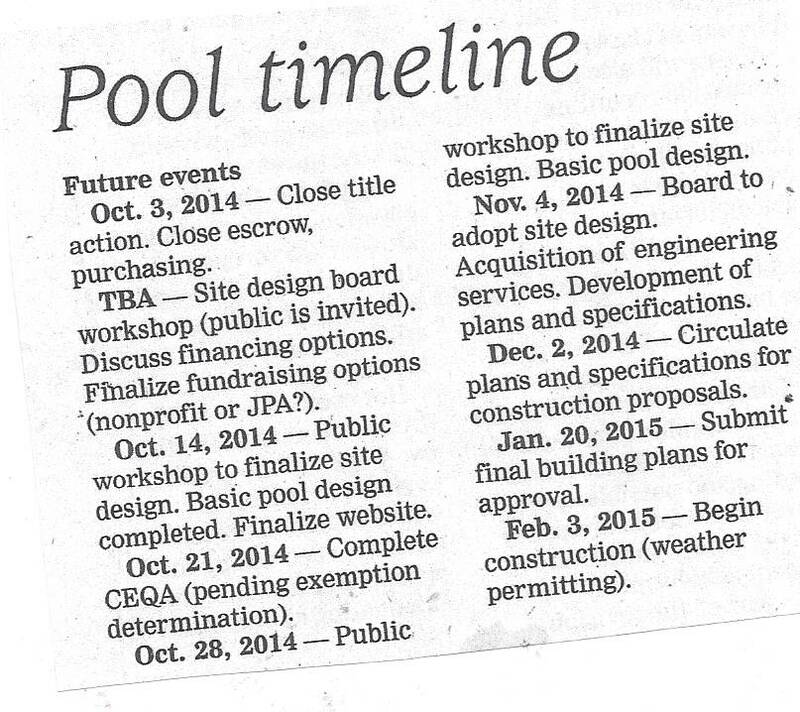 This JPA was formed in 2013 to build a community pool in Lassen County. 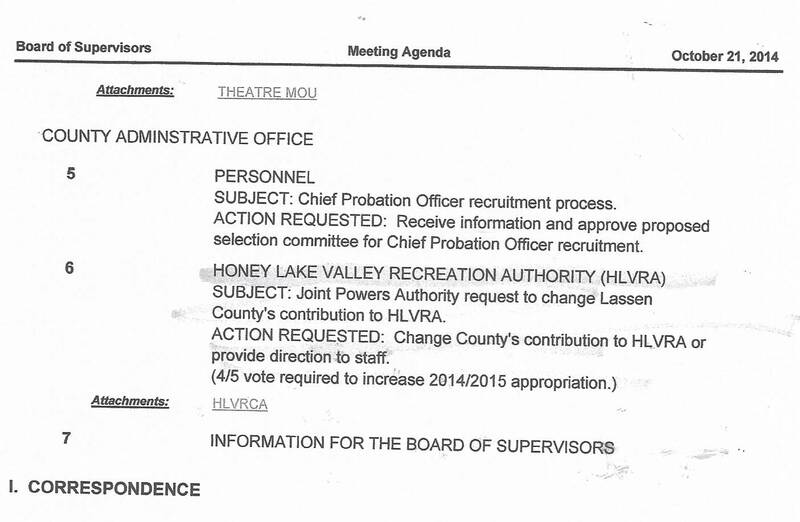 The HLVRA ran into a problem at their October 7, 2014 meeting today. They had two meeting minutes to approve but NO CHAPMAN AND NO WOSICK. This meeting had only two regular members present and an alternate. Wosick showed up at 3:15 but could not vote to approve the Meeting Minutes for the September 16, 2014 because he didn't attended only the last half of that meeting. 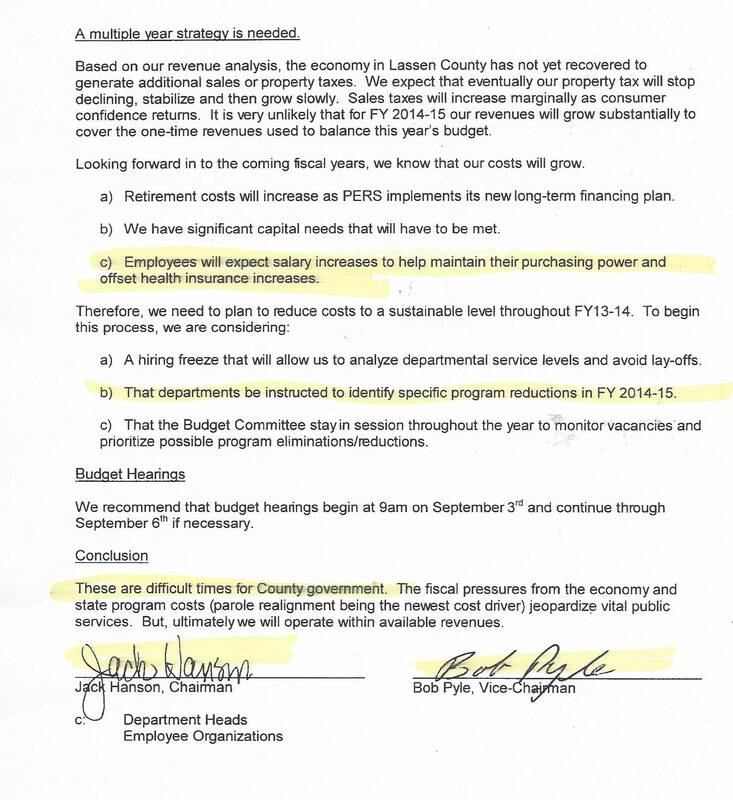 That left only two members that attended the 9/16/14 to vote, three members were needed to approve the 9/16/14 meeting. These minutes were tabled. 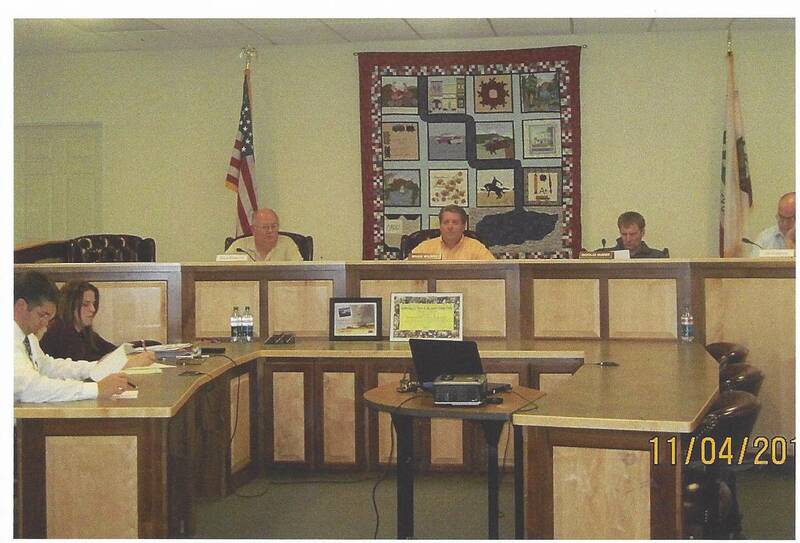 Wosick, Wilson and McBride attended the 9/19/14 meeting and these 3 JPA members can approve these minutes. 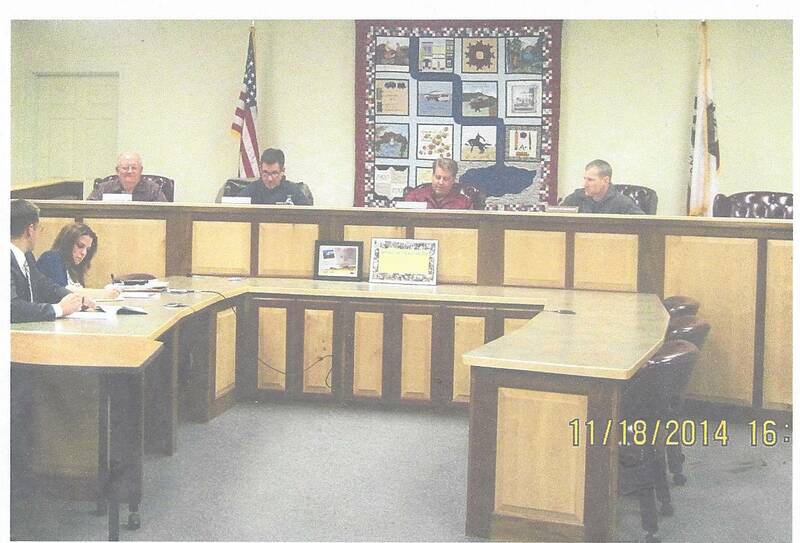 voted 10/7/14 Meeting: The alternate to the JPA sits on the far left, Brian Wilson, Nick McBride, absent were Supervisor Chapman and Supervisor Wosick. No decision was made on financing. 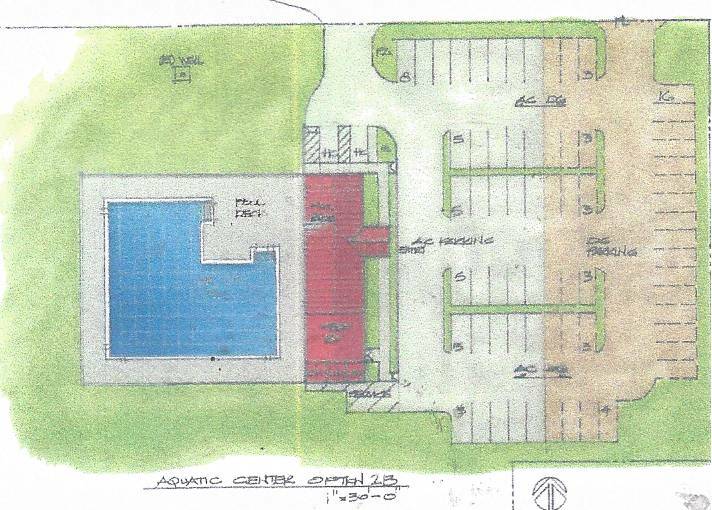 Both Susanville members and County members will agendize the options to finance the pool. 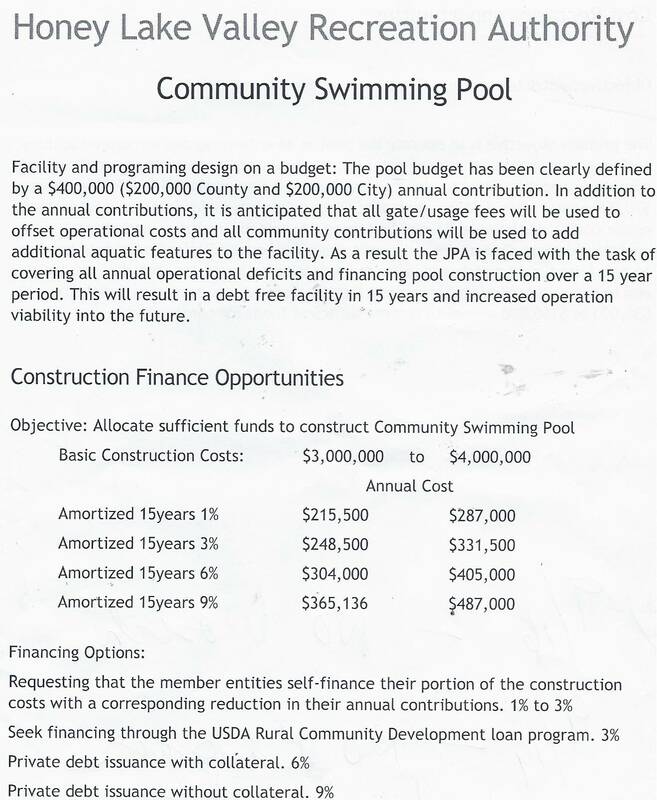 The JPA leaned toward asking each public entity to pre fund the money needed to build the pool. 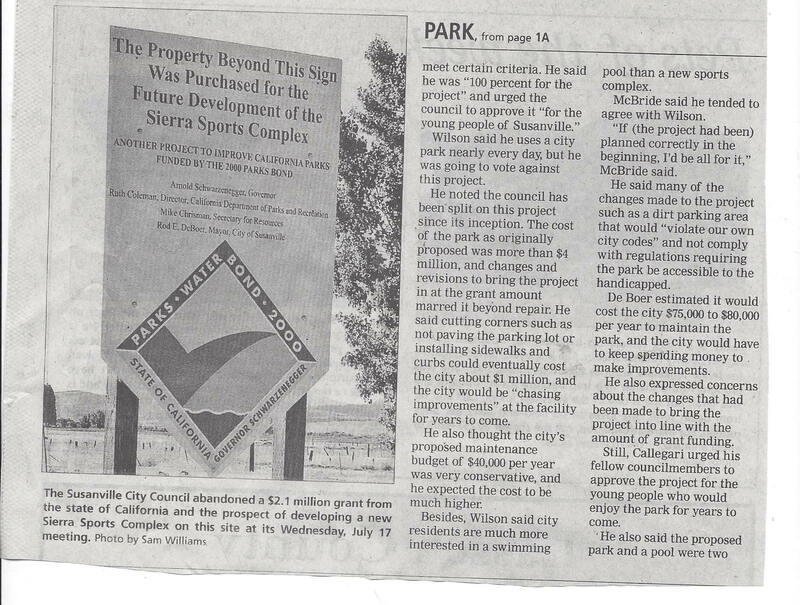 The JPA's Agenda item included a Closed Session item"
The City of Susanville, under the great leadership of Jarrod Hancock, could keep this project afloat. County Supervisors could easily upset the progress by their incessant bloviating. The Supervisors do not take notes during their meetings and literally start from square one when the pool issue, or any ongoing issue, comes up. The only Supervisor that retains "any" information is Supervisor Chapman. 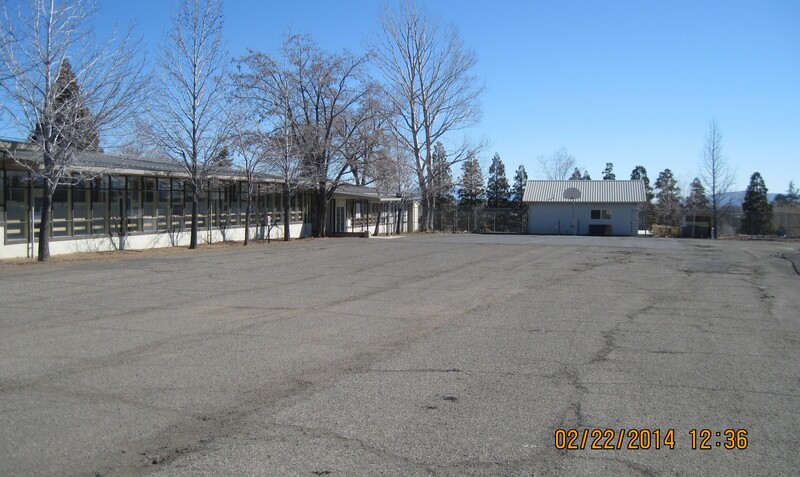 The Supervisors did state that they are considering transferring only 140 ft from the existing property line between the closed Roosevelt Pool and the old Roosevelt School. They are still a couple of months away from the transfer. Kan We Help will monitor this process. 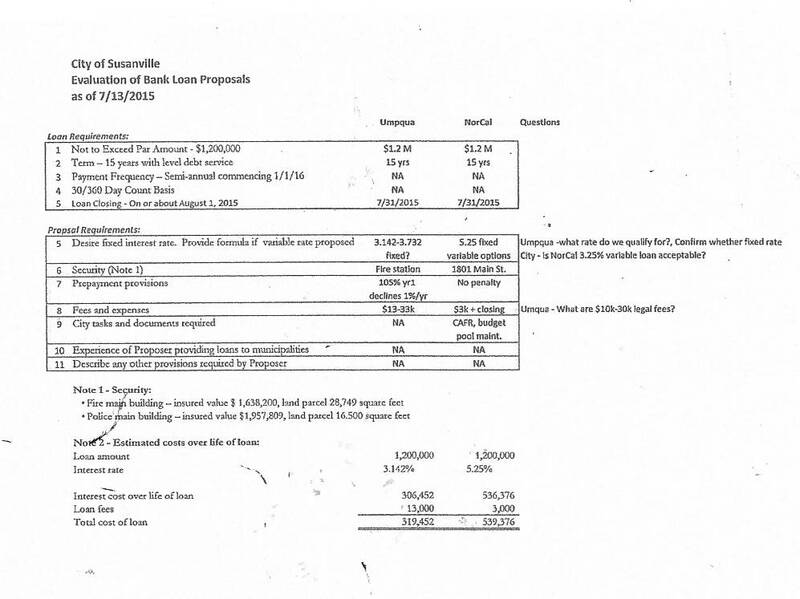 just a month after the Supervisors want to give public property away (Roosevelt Annex), they propose to spend $675,000 to remodel the Roosevelt Annex in the next fiscal year. This building is currently being used by Lassen County Health and Human Services. Sound familiar.........Health and Human Services "One Stop" in Herlong. The County poured thousands of federal money into it and then sold it to Pezzullo & friends for $172. 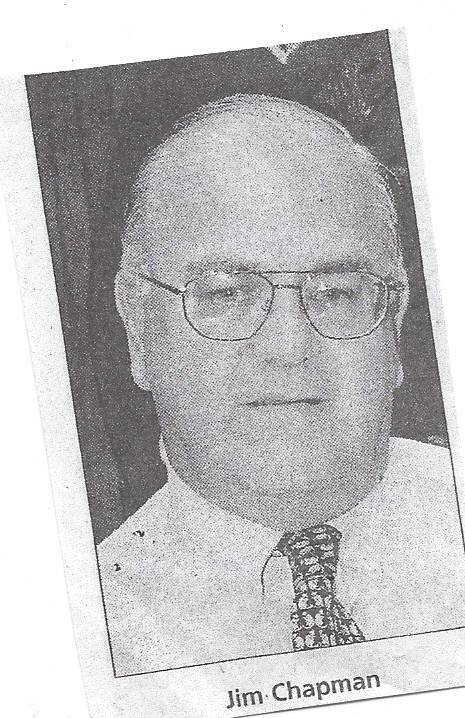 Pezzullo purchased an entire town for $31,900. 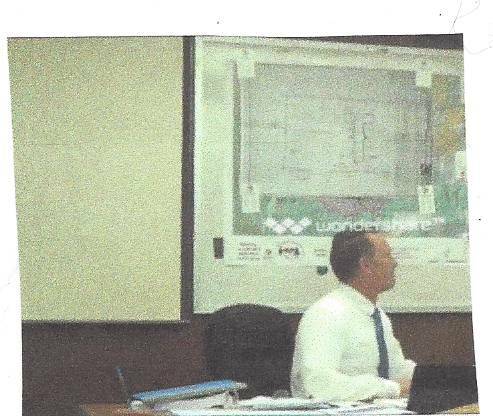 Kan We Help Secretary Eileen Spencer was cut off by Larry Wosick when she wanted to know why they were planning to spend $625,000 to remodel a building they plan to "GIVE AWAY". 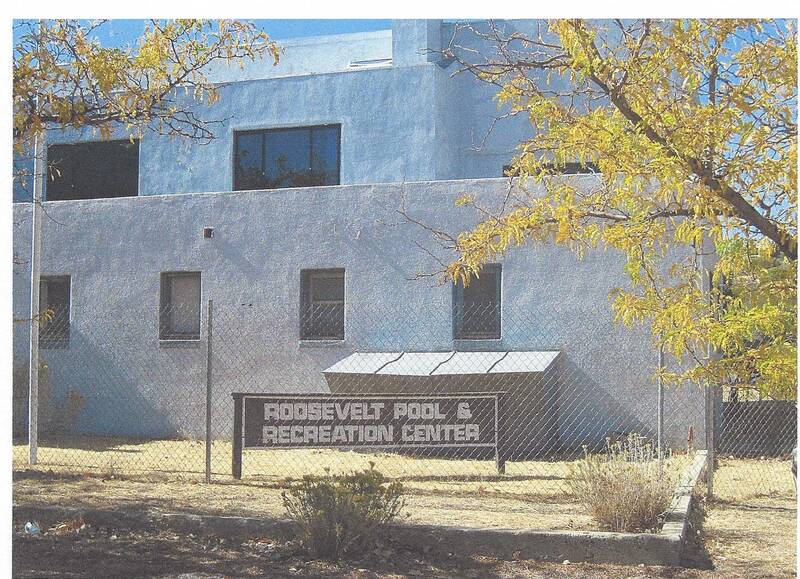 It is not a coincidence that the old Roosevelt Pool site was chosen for the new swimming pool. 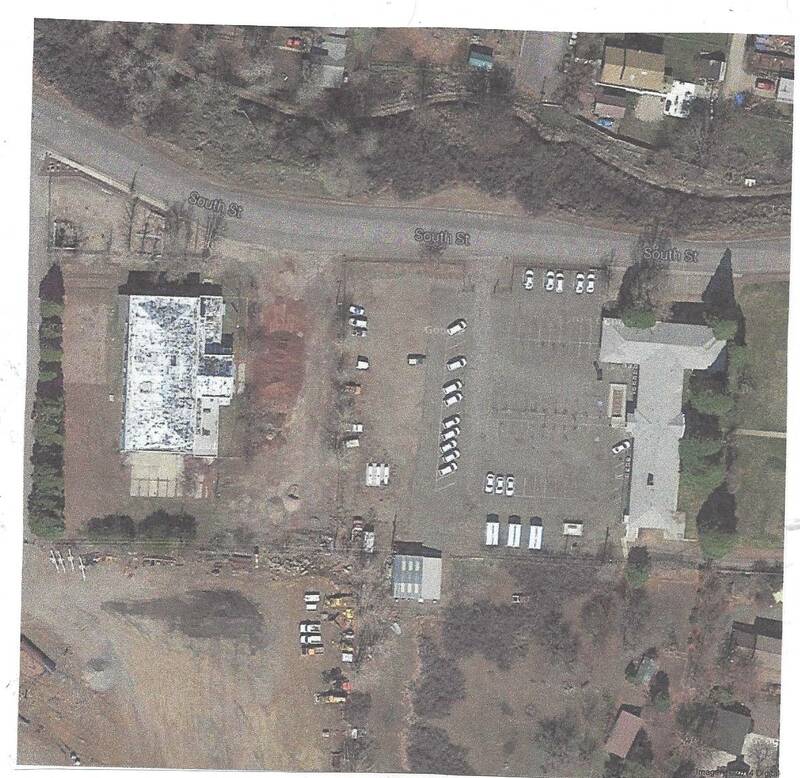 It became apparent at the Board of Supervisors August 12, 2014 meeting that this site was not chosen because it was the best site for the pool but it had the Roosevelt Annex building on the parcel. Presently this building is being used by Health and Human Services. 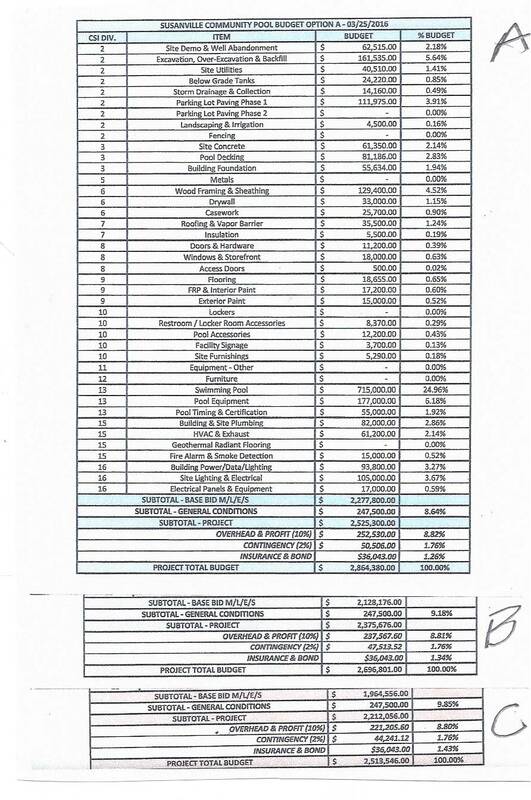 Supervisor Chapman's wants to UNNECESSARILY give a County building to the HLVRA...who does he represent? CAO Richard Egan begins his presentation by suggesting to the Board that the entire parcel (Parcels A & B) be transferred to the HLVRA, which includes the Roosevelt Annex building. 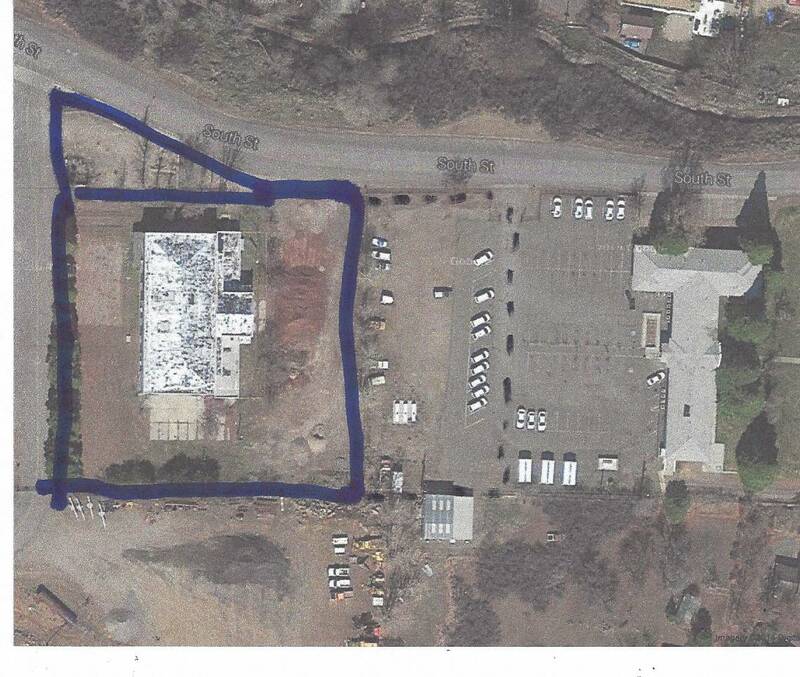 [The County signed a contact with a company to research sites. 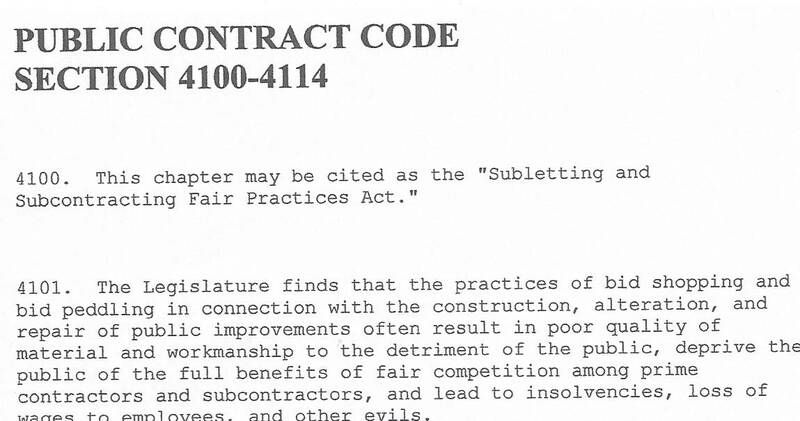 The public has asked what happened to this contract, the County's answer..........( ). right across the street from his brothers business. 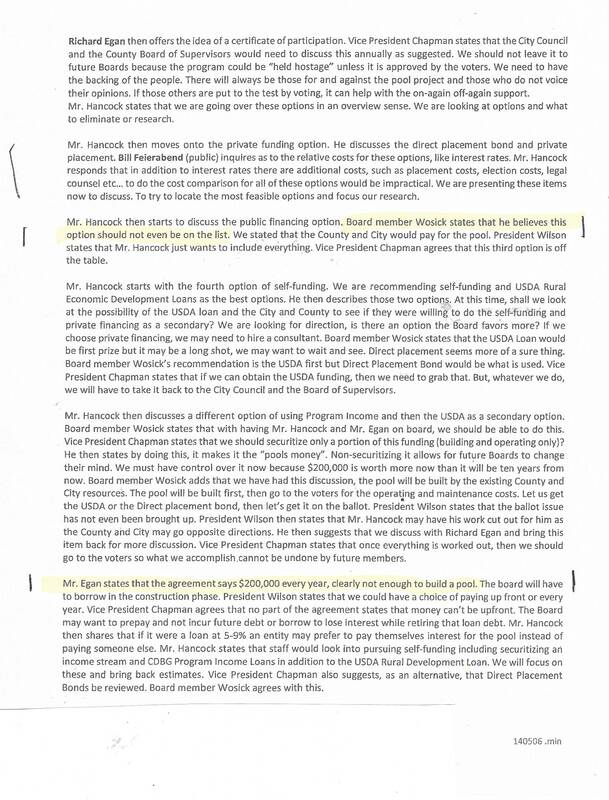 Chapman knew that the Supervisors were going to release a MEMO at the August 20, 2013 Board of Supervisors Meeting that would recommend employee pay reductions & program reductions. WHERE IS THE SHAME ? 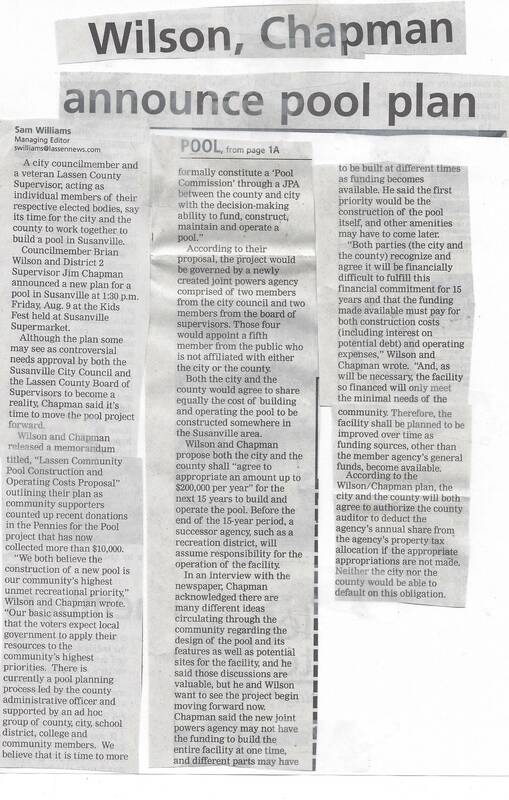 Eight (8) years later, on October 9, 2012, Chapman supported forming a "POOL" committee headed by County CAO Nichols. 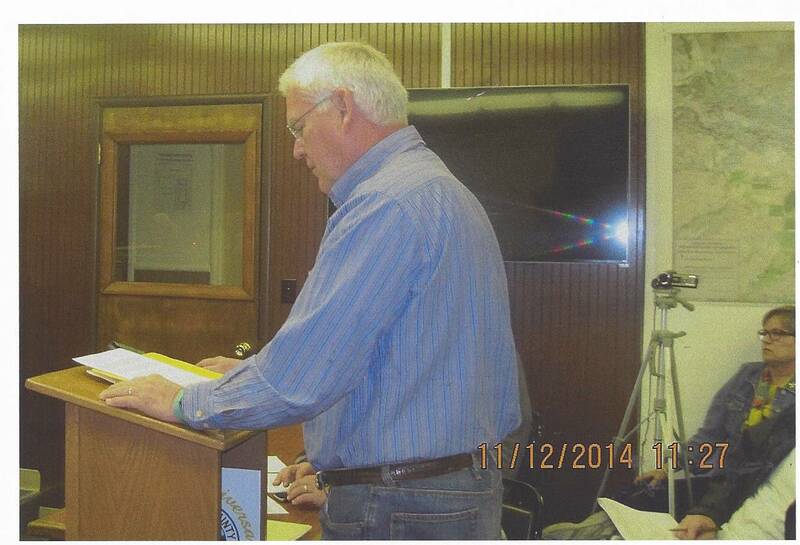 Lassen County CAO Martin Nichols was charged with returning, in January of 2013, with a PLAN. This Committee will be dissolved on December 31, 2014. 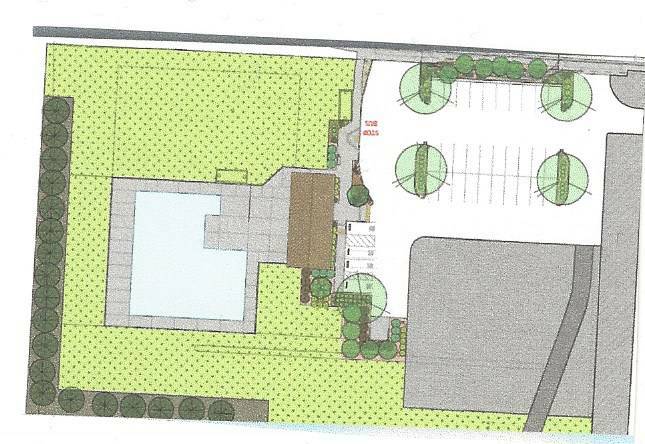 The public has longed for a community pool since the Roosevelt Pool was condemned in 2004. 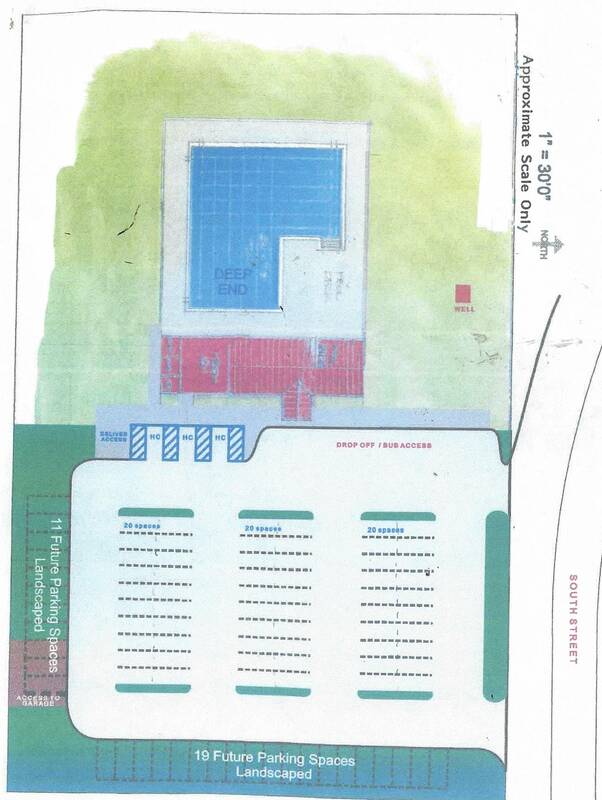 The Lassen County schools, City of Susanville and Lassen County have all been tapped for money to build a new community pool but MONEY has always been the stumbling block. 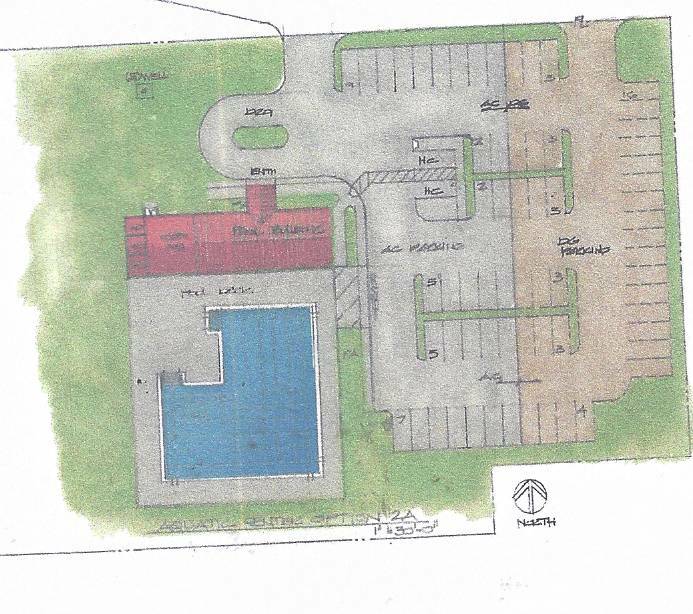 Were the $621,216 improvements to the Eagle Lake Airport more important than a pool?